It's been a long while since I last read a fantasy novel. It might even be something I left behind as early as middle school after exhausting the Lord of the Rings and all the associated appendices, Hobbits and Silmarillions. The appeal of fantasy is evident, but it also comes with a price: the vast worlds, bloodlines and histories of high fantasy are brought together through elaborate storytelling that sometimes leaves readers exhausted. This exhaustion makes readers wary of searching new worlds and opening the next saga. A Song of Fire and Ice (the book series that's the source for the brilliant HBO adaptation) is nothing if not humongous. A total of five books have been published with at least two more to come. The books themselves rarely settle for under 1000 pages, and rival LOTR in both depth and scope. A Storm of Swords is the third instalment in the series, and it is where I decided to start my new quest into the world of fantasy literature. I left the first two books alone, since I already had a good grasp of things thanks to the TV show. 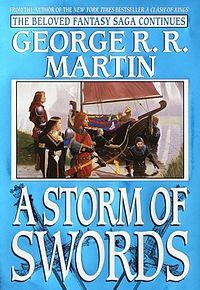 A Storm of Swords is a brilliant book that takes its time to get going (as fantasy always has) but really delivers in terms of content and plot. At the end, most of story archs have come to satisfying (or gruesome) ends that almost felt that there was no serious need to read any of the further works. What Martin does best is grow characters gradually and deliver satisfaction in terms of outcome. I don't want to go into specifics, since the plot points would only interest those who should not see them; the television series is currently only half way through the this book, which means that some significant plot points have yet to be revealed. For some reason, watching the TV series really brings more depth to the books as well. After reading the book, I realized just how brilliantly the actors had been chosen, and how the source material had been changed slightly and each and every time for the better. One of the only problems with A Storm of Swords, for me at least, was the lack of stable or reliable female characters. The series has deftly changed the dynamics of the story so that certain elements feel more deep and sincere, among them an additional depth to most of the main female cast. In the end, these two parts of the puzzle create something better than the sum of their parts. In a way, this is probably one of the reasons why Game of Thrones seems to be on everyones lips: a multi-media approach to storytelling combined with a beautiful fantasy world.